Experimenting with film is exciting to me. It feels like it has purpose. Kate Bush has always been more than your average musical artist. Its not ordinary to have a chart-topping single when youre 19-years-old, let alone a number-one hit about a classic literary text of all things. From the onset, she was more than hooks. She was a wizard of merging artistic interests, folded together into a stunning presentation of everything she could offer as an artist. Bush is never satisfied, but geniuses so rarely are, and when she masters one art form, she moves onto another with a ravenous appetite for perfection. In her art she has combined music, dance, mime, literature, fashion, and cinema into one. Her art is overwhelmingly dense and, from the beginning, few could truly reckon with her talent. Her music videos and concert television specials, in particular, are the purest distillation of her skills, and in cinematic terms, share a kinship with the likes of Maya Deren, Jacques Rivette, Franois Truffaut, and Terence Fisher. In an interview with a British Television station from 1978, Bush recalled a moment in her childhood which would have a lasting effect on her psyche and her engagement with art. She was struck by an image from a television adaptation of Wuthering Heights. She caught the last five minutes of it and, without context, the image of a ghostly Kathy (the protagonist of the novel) haunted her. It was an extreme close-up, with Kathy begging for a window to be opened so she could enter her old house. From her earliest inclinations as an artist, she was first and foremost interested in visual imagery. Bush would also say in this interview that she wanted to write a song about the image that had stuck with her, but she needed to read the book first so she could have context and get the tone right. What would become of this collision course of image, text, and music is her first number one single in Britain, Wuthering Heights. The music video that followed would be one of the best the genre has ever seen. There are numerous videos for the Wuthering Heights single, but two are widely recognized as the canonical examples in Bushs oeuvre: The red dress video and the white dress video. Both present different formal takes on the single, and both are altogether dynamic in their connection to the song. The first of these, the white dress video, is shot on a sound stage with golden, harsh lighting, emanating from Bushs body as she does her interpretive dance of the song. She makes big, swooping gestures with her limbs and has wide Clara Bow-like eyes. The image is split into two separate sections to create one fluid imageone a close-up so you can see her facial reactions to the song, the other with a wider scope so you can see the gestures shes making to emphasize certain lyrics and passages of the song. Occasionally time-lapse photography is used to give off the illusion that Bushs body is splitting into parts as she moves like Da Vincis Vitruvian Man. Cinematically, this video shares DNA with some of the earliest short films, more specifically the Serpentine Dance experiments that many different directors used to showcase how images could move in a certain way, but updated to aesthetics that would be more commonly used in early experimental music videos. These techniques were used to better capture singular movement and siren, ghostly feminine images, like in Bruce Conners groundbreaking video for Breakaway, starring Toni Basil. It would be startling in its own right if it were the only video for Wuthering Heights, but Kate Bush did one better when she donned the red dress. 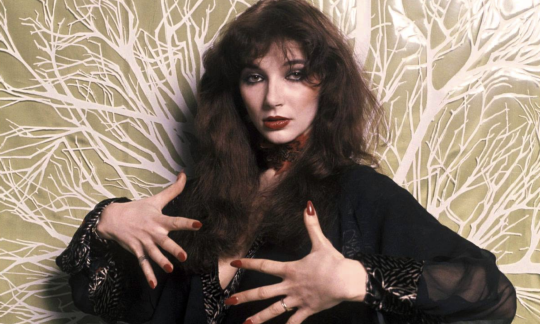 Kate Bush has always been more than your average musical artist. It’s not ordinary to have a chart-topping single when you’re 19-years-old, let alone a number-one hit about a classic literary text of all things. From the onset, she was more than hooks. She was a wizard of merging artistic interests, folded together into a stunning presentation of everything she could offer as an artist.